I've been one fortunate and happy traveler spending the majority of the last two years living in Paris and getting to see a lot of Europe. I love experiencing different cities, cultures and cuisine, but now that I'm back in the US with a zero frequent flier balance, I've decided it's time to explore more of the good ol' U.S. of A. When I was in Paris, I often shared my favorite discoveries with locals, and I was always surprised when they told me they had never heard of or been to many of the locations I liked. I was baffled until they turned the tables and asked some questions about my country. Ever been to the Grand Canyon? Yosemite? Montana? Uh, non. So this is the next chapter in travel and spending some time getting to know the country where I was born and currently live (yes, there's a small emphasis on currently). While I can't say any Europeans ever asked me about visiting New Mexico, it was a state always on my list with its wide open space, spicy fare and unique art and culture, so off I went with my friend Aimee on a 4 day adventure. If you make it to the area, here are a few highlights I would recommend for your visit. Many flights from across the country fly into Albuquerque, though LA has one flight per day that goes direct to Santa Fe, but we weren't able to grab it. There is a few block Old Town in Albuquerque that you can wander through to look at some local art and crafts, but if you have limited time and are heading to Santa Fe, don't feel bad about driving straight through, though you're going to want to stop for lunch first at Mary and Tito's before making the hour drive North. Mary and Tito's is a local institution on the outskirts of Albuquerque. It's been owned and operated by the same family since 1963. In fact we were waited on by the grandson of the original owner, who couldn't have been nicer. The carne adovado with red sauce is what you're here for, and you're going to be very happy if you put that in the stuffed sopapilla, aka the turnover. The sopapilla is a poofy, lightly fried holder for the succulent, flavorful piles of pork that are slow roasted for 12 hours. Then you throw on their famous red sauce and you're in heaven. I asked the secret to the sauce, and the answer was that they've been using the same local chili farm since they opened (no powder naturally) and incorporate just 3 other ingredients - garlic, salt and water. Four ingredients never tasted so good. It had just the right amount of heat with a very rich, velvety body. 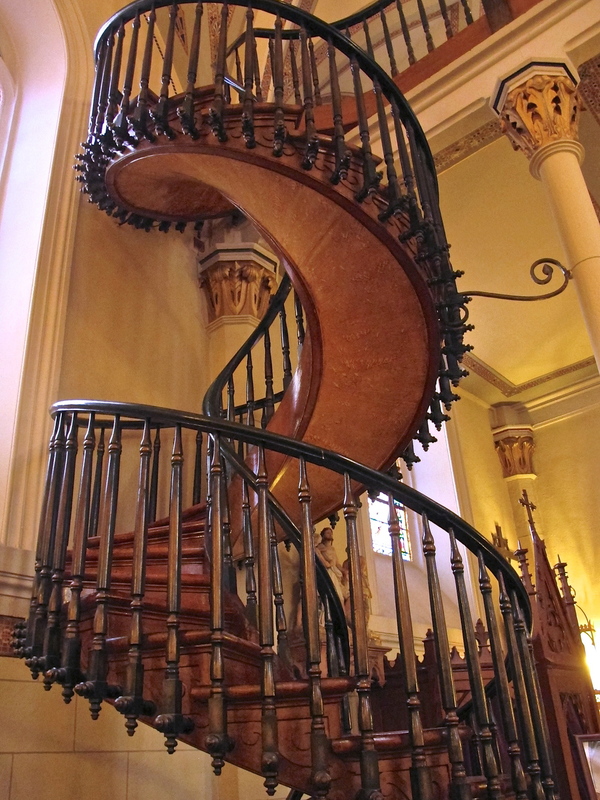 Once in Santa Fe we went right to what we heard was one of the major sites in town, the Loretto Chapel with its mysterious spiral staircase. After paying our $3, we entered the tiny church to see a large staircase that ascended to the choir loft. A pre-recorded tape played describing how the chapel was built in 1878 with no way to reach the loft. Hmmm, I might have checked those plans before building began, but regardless, after ruling out using a ladder to get up, there were prayers, then a carpenter appeared, then a freestanding circular staircase was created with no supports, even though it makes two complete 360 turns. Some say it's a miracle. I say it's a really tight staircase they might have wanted to think about before construction began. Most towns in this area are built around a central plaza and square, and Santa Fe is the same. They also have local Native Americans selling their wares in front of the Palace of the Governors. Beautiful, handcrafted jewelry is displayed and sold on the spot, and yes of course I did my part in helping to support the locals. Georgia O'Keefe spent a lot of time living and painting in Northern New Mexico, and she eventually moved permanently to Abiquiu in 1940. Eleven years after her death, the Georgia O'Keefe Museum opened in Santa Fe to continue her legacy. There was a wonderful exhibit while we were there showing both her and her friend Ansel Adams' very different depictions of Hawaii. If you're like me (but hopefully a little less obsessed with food), the thought of a Folk Art Museum might bring a glaze to your eyes, but fear not, Santa Fe knows how to spice everything up. The majority of the unbelievably well curated collection is from a single collector, Alexander Girard. Alex and his wife gave over 100,000 pieces of the colorful, picturesque objects to the museum from the around the world, and it's a true joy to walk through the different displays representing many countries' local traditions, events and culture. The dozens of tins lined up in 4 neat rows drew me into this place. I knew I'd be happy to learn what was in the containers, and I wasn't let down when I was told it was a collection of flavored olive oils and vinegars. You can help yourself and taste any of the interesting flavors before making a purchase. I can't pronounce Oleaceae, but I am looking forward to my shipment of ripe fig balsamic and pomegranate quince vinegar to arrive later this week. It MUST be time for a drink by now, right? 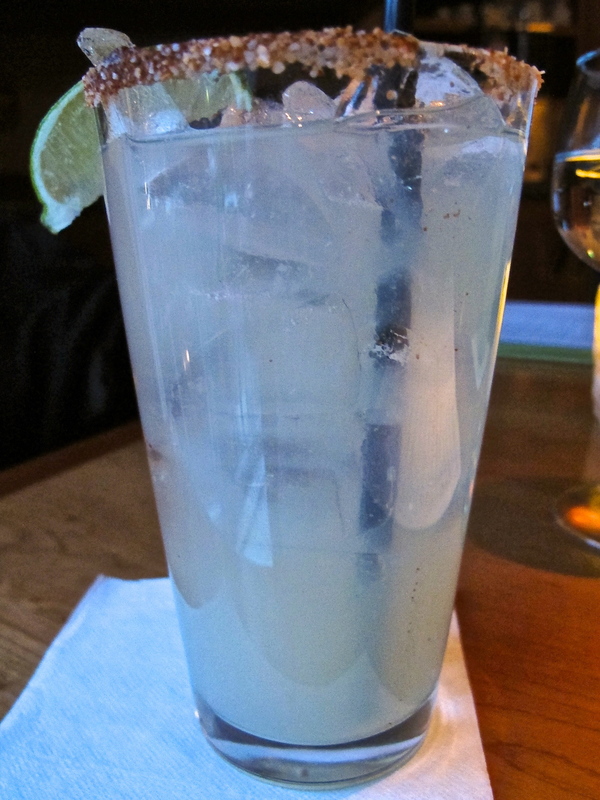 The best margarita in Santa Fe is in the Cantina at La Casa Sena. The spicy, smoky sea salts that rim the glass will have you licking your lips all day long, and of course you want their perfectly spiced, homemade chunky guacamole to go with your drink, or rather drinks, because you won't be able to have just one. But wait, that's not all. One minute you'll find yourself talking to your waiter and the next you'll see him move center stage and start singing. All of the waitstaff sing and serve, making for a fun way to start or end your evening. If margaritas aren't your thing, then don't come to New Mexico. No, no, don't fret, but what's wrong with you? Fear not, they also make sparkling wine in NM. Seriously. Gilbert Gruet is a Frenchman who has relocated to New Mexico and is now growing grapes 170 miles south of Albuquerque. You can check out his dry, and quite nice rosé at the charming wine bistro, Terra Cotta. Throw in a cheese plate, and you got yourself a good time. You might walk right past the touristy Five and Dime store with its collection of Santa Fe snow globes, but persevere and walk into the back for an equal frightening sight. 7-11 may look like 4 star dining compared to this, but what do you expect when you're here for the Frito pie. Where else can you eat homemade chili directly out of a Frito bag with a spork. Oh yes, eat this, and then go back to La Casa Sena for another margarita. Olé! This was one of our favorite meals in Santa Fe, without a spork or straw at least. La Boca is helmed by Chef James, a seven time James Beard Award Nominee for Best Chef of the Southwest. The menu is full of unique Spanish small plates like a trio of dips including carrot - garbanzo hummus with cumin, roasted beet and walnut puree, and artichoke and white been puree. The bruschetta was stacked with crimini mushrooms, a fried egg and truffle oil with reggianito cheese. We weren't afraid to pair the food with the well sourced Sherry list. Very nice meal. Santa Fe has converted a railyard to a nice collection of brick paved shops with a bustling farmer's market on Saturday's. They were selling every kind of chili you could think of and we decided to have ours baked into a flat bread with pesto. Delicious. After walking, eating and touring, you're going to want to pay Ten Thousand Waves a visit. Nestled just a few miles north of Santa Fe is this Japanese oasis with a collection of hot spring pools, saunas and foot tubs. We arrived while snow started coming down, making for a beautiful setting to sit in one of the outdoor pools with the snow falling. You'll also want to book a massage in one of the beautiful private rooms set in between a forest of trees, and then regain your strength at their newly opened, delicious Japanese small plates restaurant, Izanami. There's a beautiful drive 2-3 hours north to Taos on the scenic High Road. You get a real feel of the vast space across New Mexico with sweeping vistas everywhere. The low road return to Santa Fe is only a little over an hour and a half, and the entire journey can be done in a day. A good place to stop on the drive to Taos is in Chimayo. 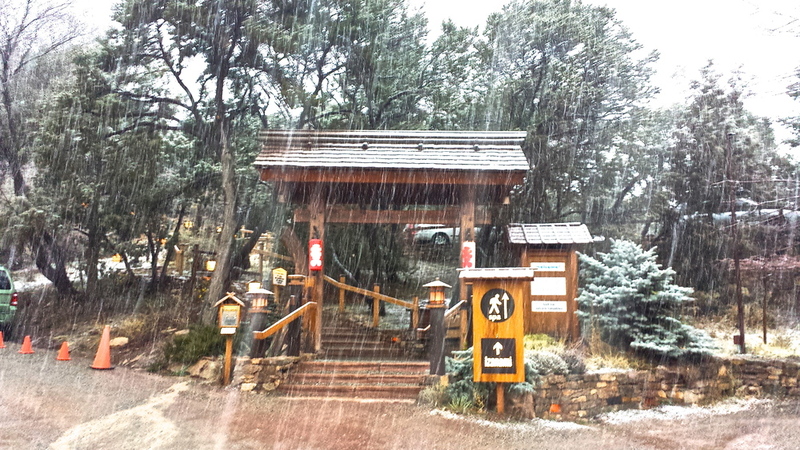 Go for a nice stroll through the El Santuario de Chimayo. Thousands make a pilgrimage here each year to experience healing and tranquility. I often find healing in a good meal, so we drove a little further to Rancho de Chimayo, a restaurant that's been feeding the local for nearly 50 years. We learned the locals love the sopapilla relleno and we also learned that everyday should be Christmas, meaning you should have both the green and the red chili sauce - the perfect gift for the indecisive or lover of all New Mexican salsa. I should also mention that all meals come with a side of sopapillas that you drizzle with the local honey. It's light(ish) and lovely. After admiring all the views along the way, you'll eventually hit Taos. You can wander the small town, ski in the mountains, or stop off at the Taos Pueblo, where you can see an authentic and still active Native American community. Taking a tour of the village from one of the younger kids who grew up and lived there, we learned that the locals have only an oral history with nothing written down or recorded, but rather, passed on through the generations through verbal stories. There's about 150 people living in the pueblo full time and they are overseen by a tribal governor and war chief. Their houses are made entirely of adobe and that means that they walls and exterior are usually replastered about every 6 months. There's no running water or electricity in the homes, making for some busy, hard working days. 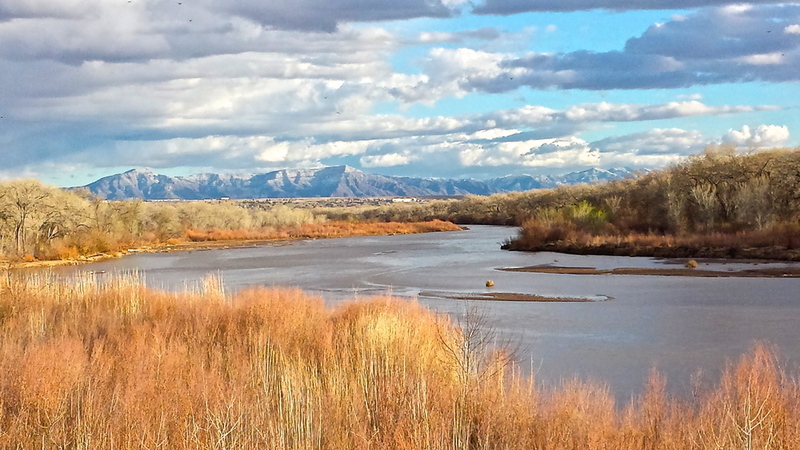 Continuing through Taos, you'll eventually come upon The Rio Grande Gorge Bridge, standing 650 feet above the Rio Grande and Rio Grande Gorge. It's the second highest suspension bridge in the US, but no, they don't bungy jump off, and they don't like to be asked that question either it turns out. The views were spectacular, but watch yourself on the bridge on a windy day or prepare to lose a glove down to the depths. 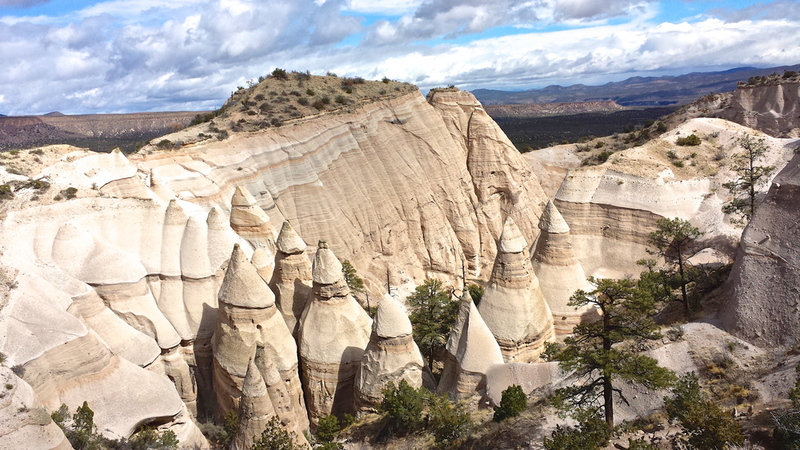 Our final stop before heading back to catch our flight in Albuquerque was one of the most memorable at the Kasha - Katuwe Tent Rocks, about 35 miles south of Santa Fe. 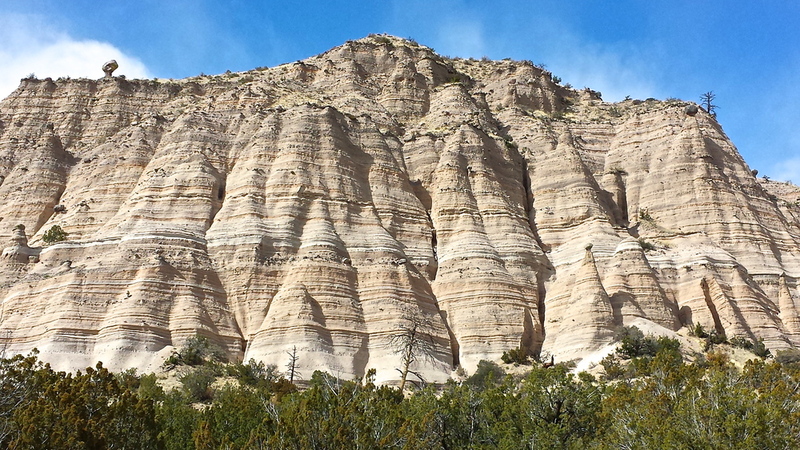 The tent rocks were formed up to 7 million years ago during volcanic eruptions. Fragments of rock were blown in the area while hot gases sprayed on top of it and then it was all cooled, creating these interesting structures. There's a wonderful 3 mile hike where you can walk under them, between them and on top of them. The Cave Loop Trail takes you to the base, and then the Slot Canyon Trail brings you between them and then up a steep trail to the top. Once you've climbed all the way up, you're left with more awe inspiring, expansive views of the area and some great final images of your trip to New Mexico.